There’s an alien invasion. Save the people! Kill the aliens! 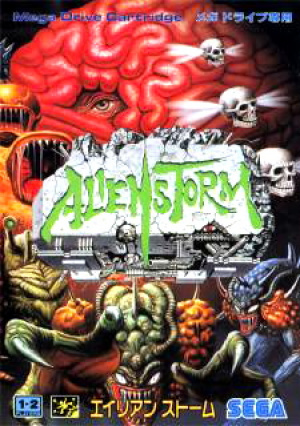 Not the most original premise for a game, granted, but Alien Storm carries its heart on its sleeve. Pretensions of artistry and greatness are laid aside; the story serves only as fodder to introduce baddies that can be slain with minimal pangs of guilt and maximum style and speed. Primarily a 2D beat-em-up in the vein of Final Fight and Streets of Rage, the side-scrolling stages are interspersed with occasional joypad-controlled shooting interludes (think 16-bit Virtua Cop with aliens). Being as straightforward about its intentions as Alien Storm is, each stage is introduced with a poignant objective. Upon having chosen one of three combatants and being thrown into the first level, “Save the people!” flashes across the screen, leaving you in no doubt as to what to do. Luckily, the control system is intuitive, and the range of moves available rather extensive. Unlike most other beat-em-ups, Alien Storm’s characters not only have a range of combat manoeuvres, but also evasive and offensive movements that become quite necessary quite quickly, with enemies filling the screen leaving you to dodge, jump and shoot your way through the hordes while attempting to lose as little energy as possible. It is in this that the game excels, its frenetic nature quickly getting the adrenaline rushing and the fingers moving at lightning speed, dodging shots and baddies from each and every direction. 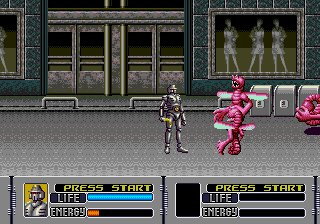 Being an early Mega Drive game, the graphics have not aged well, though in terms of design and personality the sprites still hold their own. It is, in hindsight not the arcade-perfect conversion many excited individuals of the fourth estate claimed at the time, the audio having particularly suffered for the reduction in horsepower. Despite being populated with quite catchy tunes, the Mega Drive’s sound chip is seemingly being asked to emulate a NES game as closely as possible. Somehow, though, this comes off as being entirely in tune with the kitsch of its context. The ultimate question, then, is whether the game can be recommended as a VC purchase. 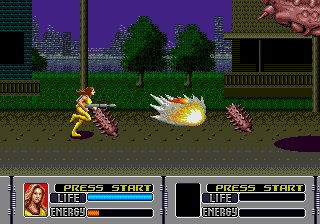 The answer is somewhat ambivalent; simply put, the Final Fight and Streets of Rage games have held up infinitely better than Alien Storm, and as such must rank higher in purchasing priority. But this game has its own charm, somewhat limited as it is, and there are undoubtedly those who, having played and appreciated the aforementioned games, will derive copious enjoyment from this as well. Alien Storm is, in the end, the Die Hard of beat-em-ups: not cerebral, but catering to its own niche because of that very fact. Miles better than Golden Axe! Much more varied, and deserves to be remembered as a Mega Drive great alongside the likes of Streets of Rage.